I just love these. I starting making them about this time last year, and now I have re-discovered them again. I first saw these over on Sonjas beautiful blog Det bla huset. Sonja is really the queen of these hearts, and you can see them on her header picture. She lives in a blue house next to one of Norways amazing fjords, where she creates some lovely things. A useful tool is one of these leather punches, I think possibly the holes could be made with something else, but it might be tricky. I got this one from amazon and used it on the number 2 setting. A small 1.5 crochet hook and some embroidery floss. A heart shape cardboard stencil. 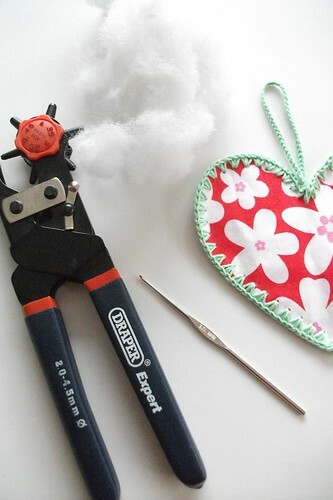 Once you have cut out the fabric and punched the holes at regular intervals, you can crochet around the edge. Here you can see 2 double crochet (UK) in each hole. Starting at the top of the heart crochet around until about 2 inches before finishing. Push in the wool using a large crochet hook and shape. Then finish the crochet and continue into making a loop for hanging. There is a little bit of a fiddle factor to these! I think they look good when they are nice and plump. Sonja has a tutorial here. 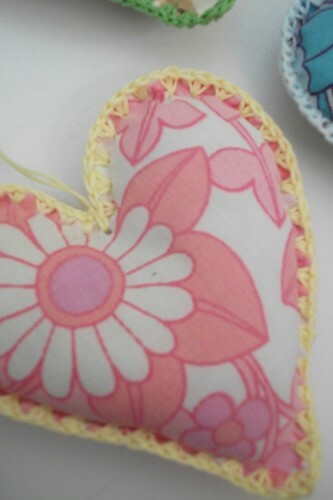 She also uses an iron on fabric before cutting out the hearts and they do look wonderfully neat! You can see some more of her creations here, here and here. I am tempted to add all kinds of granny chic bling to them, but haven't yet! They also look nice made flat, without the stuffing. Perhaps using coloured card or old christmas cards. .....just another little idea to add to the growing collection! Lastly, I am running a sale voucher in my etsy shop for 20% off until the last day of November. The code is NOVEMBERSALE. You will need to add this code at the check-out. Have a good week. I will be catching up with you soon, I think it's time for a christmas give-away! thank you Sonja, they are all lovely and I have added in the links! Love them - the crochet edging just finishes them off perfectly. These hearts are amazingly wonderful.. I love it so much. I'll try this as soon as. Stuuning little hearts! Thank you so much for sharing! I think I'll have to make some for my Christmas Tree this year... I'm aspiring to have handmade ornaments! Thank you for sharing your lovely handmades! Really beautiful Heather!!!! Love them!!! Thank you for sharing this lovely tut!! I have to try : my fabric collection is huge, so why not??? Your new self-portrait is lovely, too!! These are great love the colours. So nice, have a good week! 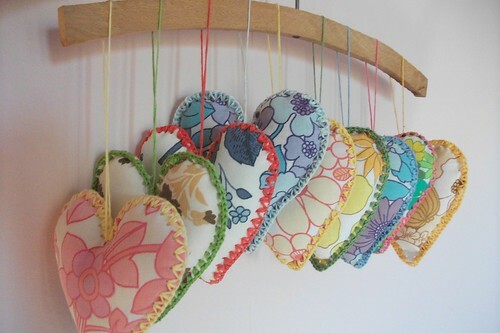 these hearts are so lovely! Such precious hearts! And just in time for ornament season. I can see these decorating the tree, being friend or teacher gifts and stocking stuffers! Hi Heather! Love your hearts!! So pretty and fresh and gorgeous : -) I can see the flat one becoming heart bunting, and the idea of vintage wallpaper, lovely ... oohh, so many ideas!! So cute! I love the vintage pattern, they look fab! These are GORGEOUS. 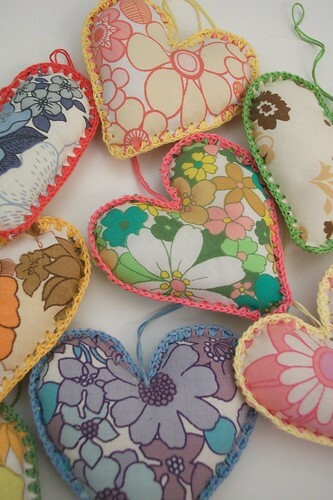 Vintage sheets, hearts and crochet, all rolled into one!? That's pretty much my dream come true. And you must have a seriously incredible vintage sheet collection - those prints are amazing! 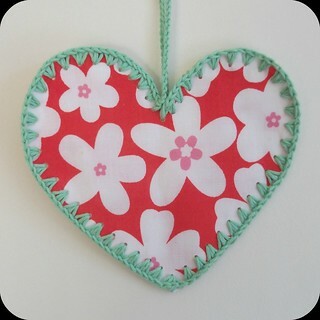 I love these hearts, the crochet edge is so pretty! Oh wow, these are super lovely. I definitely want to try making a few too! Thank you for the detailed tutorial. I just found your lovely blog and each post is more delightful than the next. I feel very excited to have found you. 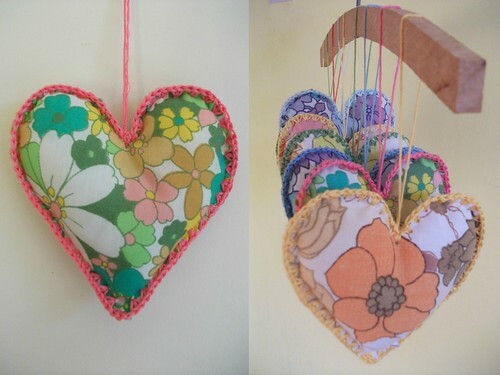 I also have a love of art, crafts, sewing and just making lovely new things for my home. Your hearts are delightful . . . I love them. My hope is that you will come over to visit and decide to follow me back. I enjoy making new friends and seeing how even though we have oceans between us, we still have so very much in common. Life is good. I have a big red vintage suitcase in the loft somewhere, you've made me wonder whats inside it now!! Oh those are great, such nice colors to. I think I`ll have to try that one out to. Nice blog by the way, I just found it.